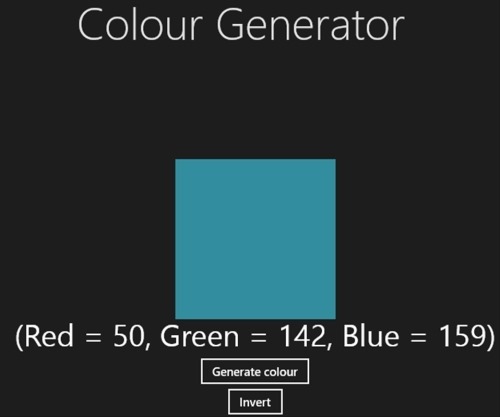 Color Creator is a free Windows 8 color generator app that brings a list of colors in hexadecimal representation or RGB. The app gets you random colors. For getting a new code, you need to click on ‘new color!’. It will quickly show you the hexadecimal code of the color. Now, if you want to view the RGB code, just click on the code, it will automatically switch between hexadecimal and RGB representation. You can copy the color code in both the formats and can paste it anywhere you want to apply the color. Well… all in all I really found Color Creator useful as it comes with RGB to Hexadecimal convertor and Hexadecimal to RGB convertor. Go ahead and download Color Creator app in Windows 8 now. Color Scheme Creator is a free Windows 8 color schemer app that lets you create color schemes out of images and pictures, using dominant colors (the primary colors) along with their harmonizing colors. It’s a color picker app that captures the pixel under the mouse and get you the presents it in Hex Code, RGB Decimal, RGB Percentage, CYMK, HSL, and HSV (or HSB). You can also search for color code. You can easily pick a wallpaper, any design, you own image to view the color code. All you need to do is just launch the app, click on ‘Create Scheme’, pick an image or wallpaper.. soon you will find all the colors (included in that image) along with their color codes. Just pick one and it will come up with a schemer where you can play around with the blends. 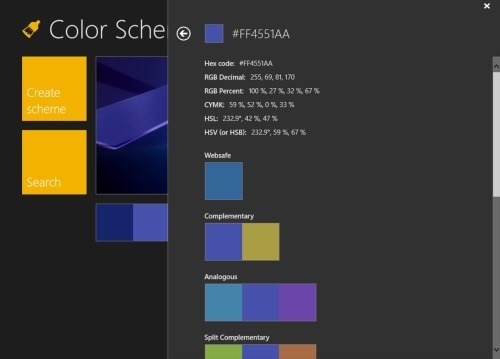 Go ahead and download Color Schemer Creator app in Windows 8 now. Also, check out our posts on Todo List Apps, Encyclopedia Apps, and Color Book Apps. Color Maker is again a good powerful color schemer Windows 8 app that lets you create random colors by clicking on ‘Generate Color’ button. The home page of this Windows 8 color schemer app comes with the colors along with the red, blue & green mixture to create random colors. Also, there is a ‘Invert’ button using which you can the exchange the percentage of mixture among colors.